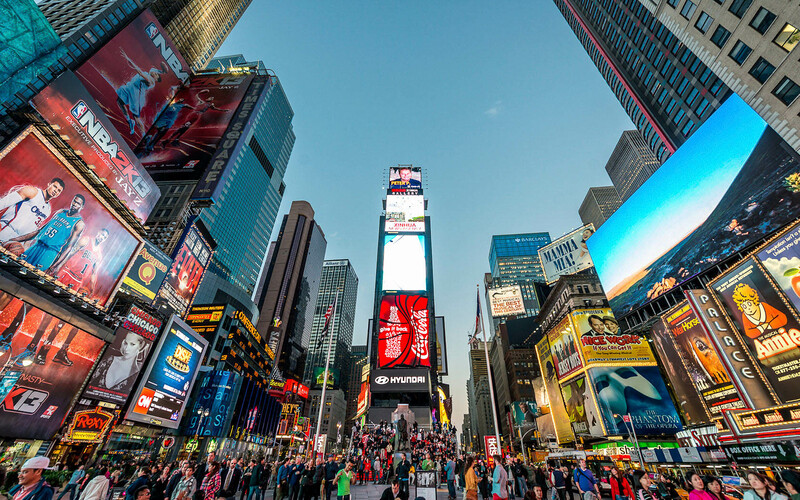 Known colloquially as "The Crossroads of the World" and "The Great White Way," Times Square NYC is one of the most popular commercial intersections in the world! Located in central Manhattan at the junction of Broadway and Seventh Avenue, this popular NYC attraction, especially among tourists, is home to top destinations such as the Naked Cowboy, ABC's Times Square Studios, and Planet Hollywood. More than a third of a million people pass through iconic Times Square NYC every day! Times Square NYC has been a popular NY attraction for over a century. It is here that Good Morning America is broadcast live to the nation, here that the New Year's Eve ball is dropped, and here that the curved seven-story NASDAQ sign has reported the fortunes and misfortunes of a nation. Times Square acquired its name in 1904 when Albert Ochs, publisher of the New York Times, moved the newspaper's operations to a new skyscraper on what was then known as Longacre Square. The name stuck, even after the New York Times moved their headquarters across Broadway in 1913. Now Times Square New York City is known around the world as a symbol of the American spirit.